A tribute to the biggest name in rock, works by iconic Mexican artists, rare tapestries, and a pianist who has dedicated her life to music create a celebration of cultural icons for the next week. Anyone alive during the early 1960s remembers the first time they saw the Beatles on the Ed Sullivan Show. Today, celebrated Beatles tribute band 1964 named themselves after that historic moment in rock and roll when they began playing pre- Sgt. Pepper’s material in 1982. Their act attempts to recreate the feel of going to a Beatles concert in the 60s. 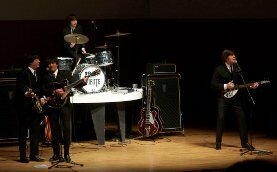 1964: The Tribute is one of the longest running Fab Four tribute bands and performs Friday and Saturday this weekend at the University of Oklahoma in Norman. Ancient Latin American civilizations remain a source of inspiration for artists throughout the Americas. A new exhibit at City Arts Center in Oklahoma City explores this concept by displaying almost 100 pieces of contemporary art from the last 80 years. “Miradas: Ancient Roots in Modern Mexican Art” features works by some of the most famous Latin artists since the Mexican revolution including Diego Rivera, Rufino Tamayo, and Gabriel Orozco. It is open until the beginning of May. The Mabee-Gerrer Museum of Art displays rare “Persian Pictorial Rugs,” some dating back to the 12th Century. Throughout the collection, the different color pallets, patterns, and weaves reflecting varying Persian cultures. The keystone of the exhibit is a pair of carpets from the early 1900s that are perfect mirrors of one another down to the detailed calligraphy. Many of the tapestries are on loan from private collections, including that of Persian rug expert Mehdy Douraghy. Douraghy will attend the exhibit’s reception in Shawnee and answer questions about the art form this Friday. The rugs are on display through March 25th. Celebrated pianist Ann Schein made her first recording in 1959 and debuted at Carnegie Hall in the early 1960s. Since then she has performed with the London, New York, and Los Angeles Philharmonics, taught at Juilliard, and even played the White House for the Kennedys. Schein is best known for her interpretations of Chopin and Beethoven. Her upcoming performance in Edmond at the University of Central Oklahoma features pieces by Chopin, Liszt, Debussy, Ravel, and Beethoven. The City of Norman celebrates Mardi Gras with the 18th Annual Norman Mardi Gras Parade on Saturday. Local artists raise money for the YWCA Battered Women’s Shelter through the Mariposa Project. The University of Oklahoma hosts the Kennedy Center American College Theatre Festival. For more events in your area visit our calendar page.